I recently received my first ever Rickshaw Bags product, and it blew me away. I was amazed at the quality of the workmanship, the materials used and the softness of the inner lining to protect my pens. In the 6 roll pen case that I received, I also loved the hand-drawn artwork of pens by Ricardo-Jorge Pinto, a friend of mine (and talented artist) from the Vancouver Pen Club. Winning me over was not easy. I prefer leather products over nylon, probably as a result of traumatic childhood memories of the cheap K-Mart nylon pencil cases. I am susceptible to textures and usually find nylon covers scratchy. When my friend, Ricardo, let me know that he was working with Rickshaw on a pen-designed case, I was intrigued. Ricardo was so kind to let me have one of his artists proofs to try. Even after having seen the great design via photo, I still didn’t expect the quality of the case to be as lovely as it is. The Rickshaw Pen case comes in two designs - one design is open at the top, and the other is the Deluxe design that contains a flap that covers the pens. I chose the case with the flap over it as I tend to throw my pens in my Baron Fig Backpack where they can move around, and I wouldn’t want a pen to fall out of the open-topped case. This is a roll-up case with space for 6 pens. The Cordura nylon is pretty smooth for nylon - but does have a little bit of that nylon roughness that I can feel if I run my fingers lightly along it. Good as far as Nylon goes, but still a consideration if you are, like me, a fan of really smooth things. As I don’t like the feel of Nylon, I have always wondered what the effect on pens would be over time. I didn’t have to worry with the Rickshaw pen roll, though - the inside of the case that comes in contact with the pens is made of a super soft material. I didn’t actually cuddle with the insides of the pen roll in bed, but it felt like the fur from my favourite childhood teddy bear and gave me a comfortable feeling. I love the soft insides and have no concerns about putting even my most expensive pen inside the case. The pen roll also has generous dimensions, as I could put my Franklin-Christoph model 66 in it comfortably. I can’t do that with my also loved Pilot Pensemble leather case. The pen roll ships flat and is a little stiff to roll at first, but after a week of use, the pen roll folds up nicely. With the inner and outer fabric, as well as the fold-over flap, this is not the tightest pen roll I have used, but if you have a bag to carry your pens, this should not present much of a concern for most people. When wrapped, the roll is held together with an elastic cord and adjustable cord lock that slides over the rolled pens and cinches tight. This is much more secure than the traditional wrap around ties of my more conventional pen rolls. I am a little biased because I have been a long time fan of Ricardo’s art; however, I do love the concept of fountain pen artwork on a fountain pen roll. Ricardo’s artwork has been rendered very nicely onto the nylon of the pen roll. There may be a little bit of fidelity loss, as the nib branding is sometimes not entirely clear; however this is probably a good thing to keep the patent lawyers happy. However, the intricately designed colours are bright and are printed nice and clear. Ricardo has drawn 8 pens on the outside cover of the pen roll, while the inside only has 6. Because of less space. I really like that the pen designs fit over each pen slot. I have resisted the temptation to try to match a pen in each slot with the drawing, as I think I would have to pick up a couple of pens I don’t own yet. This pen roll is a great conversation starter as the pens are all drawn uncapped and it is evident to anyone that looks closely at it that the roll will contain fountain pens. The pen alignment in the design matches the nib direction on the pen - ensuring that this case is always stored the correct way up in my bag. Included pen illustrations include the Visconti Opera Cherry Blossom, a Pelikan M205 Blue Marble, several colours and designs of TWSBIs, an Otto Hut design pen and a Pelikan M805 Vibrant Blue. I am sure you will agree that Ricardo has some great pens in his collection to work from. I have used this case for a few weeks and enjoyed it. I think the fabric is relaxing and becoming more flexible with time. This looks better, in my opinion. The background to the case is white, which so far has not gotten dirty, which is probably a testament to the durability of the material. I am a little worried about ink stains, but figure that will just add some character to the case once it does happen. I will not be putting any Bay State Blue in this case. Rickshaw states that the fabric is machine washable, but I have not washed mine at this point. I love pen rolls and, despite my reluctance to use Nylon carrying bags, really like this bag. The design is fun and bright, and the pen roll is very well designed. I feel very comfortable using this roll with all of my pens because of the soft inside. 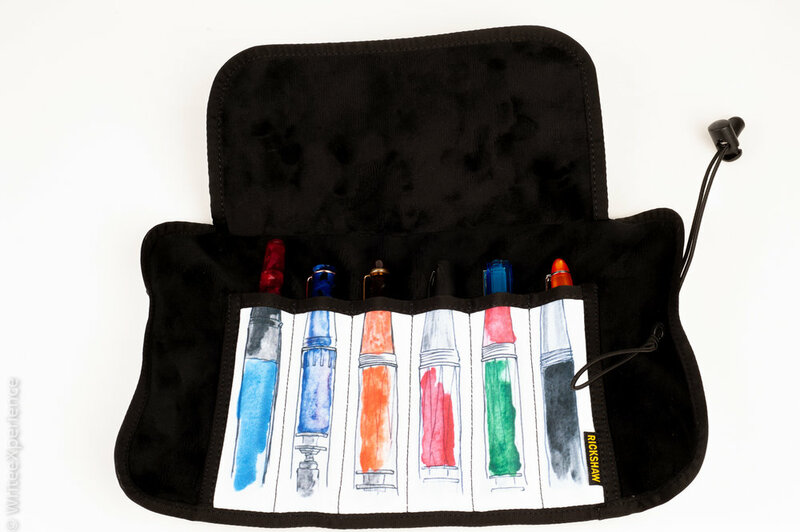 If you are in the market for a new, fun pen roll, I recommend you check out the Rickshaw page. They also have some other cool designs in case you are looking for a more subtle design.